Dental implants are a popular, permanent solution for one or more missing teeth. Unlike other missing tooth solutions such as unsecured dentures or bridges, dental implants also help to preserve the jaw bone and surrounding structures. There are many reasons we see patients with missing teeth. Untreated gum disease or decay can lead to tooth loss, as can accidents and injuries. Whatever the reason, if you have lost one or more teeth it can cause you to be embarrassed about smiling. As well as aesthetic concerns, missing teeth can cause further dental health problems. Remaining teeth may try to move to fill in the gap, leading them to become crooked and difficult to clean. In addition, the gums and jaw bone may start to recede over time. Dental implants address these problems and give you back confidence in your smile. Dental implants are small, metal screws or posts placed directly in the jaw bone. They act in much the same way as natural tooth roots and provide support for replacement teeth in the shape of crowns, secured dentures or bridges. All of the dental implants at our Stockwell clinic are placed by implantologist Yusuf Alshafi. They can be used to replace a single missing tooth, several missing teeth or even to replace all of your natural teeth. Implants will be carefully and precisely placed in your jaw in a procedure that can in most cases be carried out under local anaesthetic. Temporary crowns, bridges or dentures can be placed at this time, before the implants are left to heal for an average period of three months. Exact healing time will vary from patient to patient, and your projected healing time will be outlined at the start of treatment. Once the implants have had time to heal and integrate with the jaw bone, permanent replacement teeth will be fitted. With proper care dental implants should last for many years, giving you the ability to bite and chew food in much the same way you would with natural teeth, and giving you back confidence in your smile. For patients who have lost all of their natural teeth, dental implants are often an excellent solution. Dental implants are small metal posts or screws that act like natural tooth roots and support replacement teeth in the form of secured dentures, bridges or crowns. The good news is, if you are missing all your teeth, you may not require as many implants as artificial teeth. In many cases one implant can support several replacement teeth. All-on-4 and All-on-6 dental implants are a revolutionary system enabling patients to have a full set of teeth fitted with the minimal number of implants. This system is even suitable for patients who have been told they cannot have dental implants because they have suffered significant bone loss. The All-on-4 dental implant system was developed by Nobel Biocare to give you a permanent set of replacement teeth that won't slip or fall out like unsecured dentures are prone to do, but will enable you to bite and chew food, keep your sense of taste, and smile with confidence. In many cases, All-on-4 implants can be placed in one appointment. Two implants are placed at the front of the jawbone and two are placed at the back. 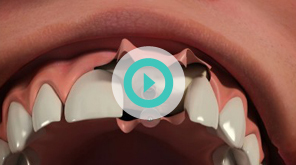 The front pair are positioned parallel to where your natural teeth were, whilst the back pair are placed at an angle, helping to spread the force created by chewing and providing strong overall support. If you are interested in All-on-4 dental implants, you will first need a dental implant consultation to determine if this is the best treatment option for you. Before having the implants fitted you will need a CT scan to determine the best position for your implants, using special NobelGuide software. Your dentist will remove any remaining, unsalvageable teeth if necessary and will carefully place the implants. Temporary dentures or bridges can then be fitted, with final tooth restorations fitted after a healing period of between three and six months. The All-on-6 implant system works on the same principles, with two additional implants fitted at the back of the jaw, for additional stability.